We gather on Friday nights for a time of live Worship and Prayer. Sunday evenings we meet in a bible study setting to go deep in the Word. 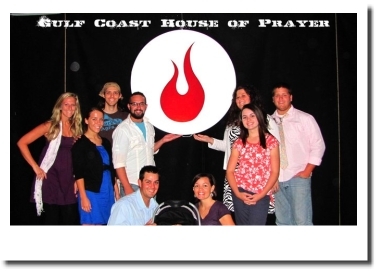 Gulf Coast House of Prayer is not a building but a company of intercessors gathering weekly to see the spiritual atmosphere of Escambia, Baldwin and Mobile County changed through Prayer and Fasting! It is also a network of Gulf Coast Intercessors with like Vision crying out for God's purposes to be released in our region. As Intercessors we need to be connected and united in prayer to see the fullness of Gods Glory manifest in our region. God is raising up Intercessors all across the globe, He is calling the Church back to the place of prayer where the Church was originally birthed; the upper room in Jerusalem. There is a Joel 2 call going forth across this Nation to return to the Lord with our whole hearts, in prayer with fasting, weeping and mourning. We must rend our hearts, take up our cross and give ourselves to His purposes in our generation. We must set aside our agenda and give ourselves to His. We must get a higher Vision of God. Let us come together in the place of Prayer, remind ourselves of His promises and lets partner with Him in Intercession to see them come to pass. God send Revival to the Gulf Coast!